Coconut is healthy and delicious. It is also native to cuisines around the world, including Thai, Indian, Filipino, Vietnamese, and many Caribbean cultures. 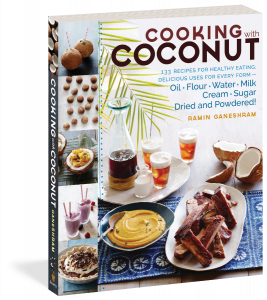 Cooking with Coconut offers a tantalizing taste of this tropical superfood’s culinary diversity, with 125 original recipes using coconut in all its forms. Options span the menu, from breakfast dishes like Savory Coconut Crêpes to dinner and dessert dishes like Asparagus with Shallots and Shredded Coconut, Coconut Pork Kabobs, and Coconut Rum Crème Brûlée. Ramin Ganeshram, an award-winning food journalist, dishes up everything home cooks and health-conscious eaters need to know to fully enjoy this delectable powerhouse!